Southern bluefin tuna is a species of tuna only inhabiting the southern hemisphere. 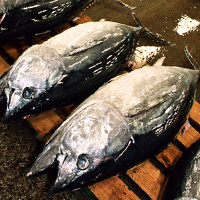 Bluefin tuna has been deemed the high class tuna when it comes to sushi due to its availability. It can also be found eaten raw in donburi bowls. The calories in Southern Bluefin Tuna per 200g(1fillet) is 186 calories. Southern Bluefin Tuna is calculated to be 93Cal per 100 grams making 80Cal equivalent to 86.02g with 43.2g of mostly protein、0.2g of carbohydrates、0.2g of fat in 200g while being rich in vitamins and minerals such as Niacin and Vitamin B6.